Wikipedia's one liner says "Flirting is a form of human interaction between two people, expressing a romantic and/or sexual interest"
Flirting is often used as a means of expressing interest and gauging the other person's interest in courtship, which can continue into long-term relationships. Some times it may be done simply for immediate entertainment, with no intention of developing any further relationship but this type of flirting sometimes faces disapproval from others, either because it can be misinterpreted as more serious, or it may be viewed as "cheating" if the person is already in a romantic relationship with someone else. I observed that we all have a bit of flirting nature within us. We all do flirting but it depends who is the target. Let's do not take flirting in the sense that we are doing it with a girl. When we meet new people or a person with a higher authority like our boss, we always try to impress them; we talk to them politely and try to act intelligent so that they get a good impression. When we act like a person who is different from our original personality our whole body language gets changed. For example: If I am talking to a girl, my body language and way of talking is far much different as compared to the way of interaction and body language I have when I am talking to a man or to my boss. At work, flirting is usually acceptable only in certain areas, with certain people and at specific times or occasions. There are no universal laws: each workplace or working environment has its own unwritten etiquette governing flirtatious behaviour. Generally in flirting phase we always tends to be a nice person, we have small or little smile on our face which shows a glowing charisma on our face. A person with Type A personality gets converted in to Type B personality (don't know about Type A and B personalities,refer wikipedia for best example) and vice versa during flirting. Little bit Flirting is also good (I think this way) as it lets us to be a polite and good to all.It is a universal and essential aspect of human interaction.We always want that some body appreciate us and laughs at our jokes. We all try to create environment where all persons involved have a good time with each other so that we can again catch up, well this thing results in formation of small groups. We Give our complete attention to the person in which we are interested.We laugh ath their jokes,listen to their stories, and we don't get distracted by what's going on around us as It is more important to seem interested than to seem interesting. Some times some people do not like flirting at all so please read the body language before doing flirting.We look for such person who seems approachable and appear interested in you and then it starts with small smile to small talk (verbal flirting) and than to fun. Flirting is a basic instinct, part of human nature. This is not surprising: if we did not initiate contact and express interest in people around us. Road side barbers are very rare to see.If We spot them than we just pass them in our every day life.I was wondering how a new day starts for these road side barbers.Each and every day they have an hope in their eyes to earn more as compare to previous day.They used to stand in the shadow of a tree where they have fixed their mirror on the stem of tree, have a wooden chair and their apparatus used to cut hairs and shave.I don't know how much their hair cut costs but may be around 5-10 Rs.Every day they pray to god that at least they should get enough money so that their family can have a proper meal. These days husband and wife works in a good firm so that they can have a good life for themselves and for their children but a barber and his wife works so that they can get a meal for their children and if possible than save it for the next day.Some times i think how they manage to survive if they don't have a single customer in a day.May be they had enough customer of their level and i am thinking like this as i didn't get chance to see any customer on their wooden chair. Good thing is, at least they are doing some thing instead of begging.They have the courage to fight eevry single day to move ahead in their life.Taking hair cutting as a profession is good for those who have some amount of money in their pockets to setup a shop with a pair of chairs equipped with various creams and electrical gadgets but it is an obligation for such peoples by which they can earn their bread. 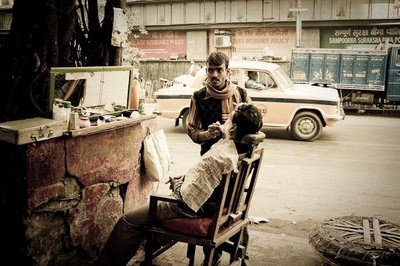 These days barbers have converted small shops to a full fledged saloon with an Air conditioner but a road side barber will never have such things,he will only have the courage to survive with his scissors and razors. When i went to Vaishno Devi i asked myself that whether it is an holy place or a place of business, a place to pore in money in the name of holy goddess.Although Vaishno Devi shrine board provides lots of facilities to all devotees at various places.I got the business kind of feeling when i saw the facilities like battery operated auto rickshaws upto bhawan @100 Rs/ person and helicopter facilities from katra to the point Sanjichhat@ 1225 Rs/person which is just 2.25 kms away from bhawan. When I stepped down at Katra,lots of people came and asked for Hotel room,all claiming cheap rooms,some claimed that they will charge for taking care of our luggage and we can take bath at their bathrooms and start our journey by giving an charge of Rs 100.Katra is a city which never sleeps and all the devotees keep moving across it on 24x7. After taking a room and getting fresh we proceeded for taking Yatra Parchi which is an entry pass for beginning Yatra from Banganga check post.When we reached at Parchi counter we got shocked to see the long queue.A long queue of devotees waiting to get Yatra parchi so that they can begin their journey but to surprise Shrine board has closed the Parchi counter as they were not able to handle people at bhawan and they reported to have 50000 devotees at bhawan.They announced that due to over crowded ness counter will get open at next morning 5 am so that they can have control over the devotees.After hearing this i and my friend left for hotel and we planned to come back at around 3 am in the morning so that we can get Yatra parchi in the first slot.We returned to our hotel,slept and waked up at 2 am so that we can again reach at the counter at 3 am.When we were on our way to counter we saw many peoples sleeping at the road side,many people can not afford a room in a hotel,they were sleeping with their luggage with them.We were expecting that there will not be long queue as no one will come so early but we were wrong.We were at the same place in the queue where we left last evening.Peoples didn't left the queue and they were sleeping on the road itself.I saw the devotion towards holy goddess that people didn't bothered to leave for night.I some how managed to enter the line from front where people were waiting for door of counter to open.When door got opened at 5 am,people broke the queue and they were trying to enter the gate,the situation was so bad that security guards were doing lathi charge but still people were entering the gate by climbing on each other.I saw that one woman fell down due to rush and people were crossing her,some how one security guard came and took out that woman.I too flanged the queue and managed to get inside the gate.Internally i was thinking that i am doing cheating with the people who were standing in the queue from last day without catching any sleep and food but every one was doing that.I asked myself that "Is every thing fair to get an glimpse of holy goddess?". After getting Yatra Parchi,we reached Banganga checkpost .Here we have to go through security check which involves the x ray examination of your luggage and checking of individual by security guards,Beyond this point the Yatra of Vaishno devi starts.We started climbing and took a bath in Banganga river at Banganga gath.Around 9:30 am we resumed our Yatra and kept climbing towards the Ardh kuwari which is in half the way to bhawan.There are lots of shops present on the roads which have drinking water,cold drinks and other things.Vaishno devi shrine board has also installed drinking water taps at various points from where devotees can refill their water bottles.We were climbing,taking breaks in between when we got exhausted as sun was shining along with cool breeze of air.We were reaching higher and higher by crossing mountains to mountains,watching natural beauty of hills in the shining sun light.Awesome,natural beauty. After a walking of 6 kms we reached Ardh Kuwari at around 12:30 pm.There was so rush that we got the number of next day afternoon to enter the holy cave of Ardh kuwari so we skipped it and moved towards Bhawan. Lots of devotees were coming back from bhawan and lots of people were going towards the bhawan by enchanting Jai Mata Di all the way.There was a excitement in all of us, we all were so enthusiastic and energetic that we were not feeling tired.I saw some devotees who were not just walking like us.They just lie down on road completely and then get up and again lie down from the point where his hands were.My god, was the word which came out of my mouth when i saw them.How much devotion they had for Vaishno Mata.Some of them were walking through their knees.Vaishno mata gave them energy to do so.Around 4 pm we reached at Bhawan.There we took prashad and took a locker to put our luggage so that it can be safe. There was a queue for final darshan,around 4:45 pm we were in the queue and after 15 minutes we were standing at the holy cave of Vaishno Maa.Queue was moving slowly and priests were not allowing any person to stand there.We got an chance to see the three goddess only for just 3-4 seconds.There was an different kind of feeling, my eyes got filled with tears when i saw Vaishno Maa, I don't know why.We forced to move from there and we left the premises,collected prashad and moved towards our locker to take our luggage.After putting some food in our tummies we moved for Bhairov nath temple as it is said, in order to complete the Vaishno Devi Yatra one should go to Bhairov nath temple otherwise Yatra will remain uncomplete. After visiting Bhairov nath temple,we started to move downwards. around 8:15 pm.We were so tired that we were not able to walk but some how we managed to get Ardh Kuwari at around 10 pm.We had our dinner,took some rest and again started to move down.God our legs were not supporting us,after every 100 meters we were taking rest and thinking how we will manage to move down.Some how we reached Banganga check post at around 1 am and took an auto from there to our Hotel.When we reached our room,Dhammmm was the sound which i heard and than i lost control on myself and went into a deep sleep after complete 24 hours which included all the hush-hush for getting Yatra Parchi to our continuous Yatra. Vaishno Devi,a holy place: where devotees are ready to do anything to get a single glimpse of mata.A place where Shrine board provides free medications,free dispenceries,free blankets and free accomodations to devotees. Vaishno Devi, a Business place: where people earn money by carrying devotees on their back,on their horses and ponies,on palkies (palki is a kind of chair fitted over two bamboos which is carried by four persons to take an devotee to Bhawan).A place where Hotels charges are sky rocketing,where a cyber cafe charges 10 Rs for a print out and 30 Rs for half an hour surfing with an minimum amount of 3o Rs.